Teachers’ Day is a great expression to pay tribute to the teachers who spend their lives in nurturing the young citizens of the country. The role of a teacher in any society is remarkably significant: they inculcate good values and morals among their students, thus becoming helping hands in the building of a nation. Teachers’ Day is celebrated around the world on October 5 every year. Nations usually eulogize a native teacher and celebrate the occasion on their birthday or any other significant day associated with education. Hence, the day of celebration varies from one country to another. Around eighty nations all over the world celebrate the day; and 11 out of them share a common Teachers’ Day on February 28. 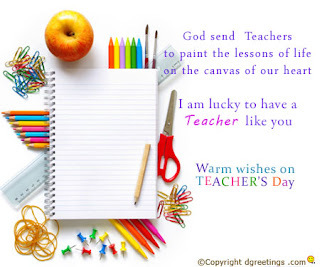 Coming in a few days in India, Teachers’ Day falls on September 5 every year. The day commemorates Dr. Sarvapali Radhakrishnan’s since 1962. Dr. Radhakrishnan was the President of India during 1962; also, he was an accomplished philosopher and educator. Indian schools organize a grand festival on the day. The ceremony usually begins with a speech dedicated to teachers. It is furthered by elaborated feast, dance and songs. Usually, students perform the role of the teachers in schools, to express their gratitude. The beauty of Teachers’ Day is that it cultivates the bond between a student and their teachers. Traditional ways of greeting one’s teachers is by dedicating them a greeting card. In fact, these days there are so many creative gift ideas for Teachers’ Day. Also, with changing times devotional messages to teachers can be easily sent through E-cards. 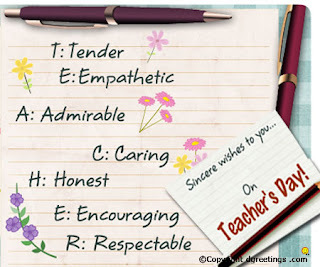 Gifts and cards are beautiful way to articulate your affection and respect for your teacher. We all have been students sometime in our lives; and Teachers’ Day gives us a chance to dedicate a day to our honorable educators.